Salmonellosis is one of the most common foodborne diseases in humans posing a major public health concern worldwide. It is caused by ingestion of contaminated food with non-typhoidal Salmonella. The most common foods that have been linked to transmitting salmonellosis to humans include poultry, eggs, beef, milk, cheese, fish, shellfish, vegetables, fruits and juice. Illness in humans is primarily characterised by self-limiting gastrointestinal disease associated with diarrhoea, abdominal pain, nausea and vomiting, headache, chills and fever. However, Salmonella Tyhimurium, the most common serovar of non-typhoidal Salmonella, has been associated with bloodstream infections, invasive illness and even death in Sub-Saharan Africa especially in children, elderly and people infected with malaria or human immunodeficiency virus. Fig. 1. Phage typing: a culture of bacteria infected by different bacteriophages (viruses). 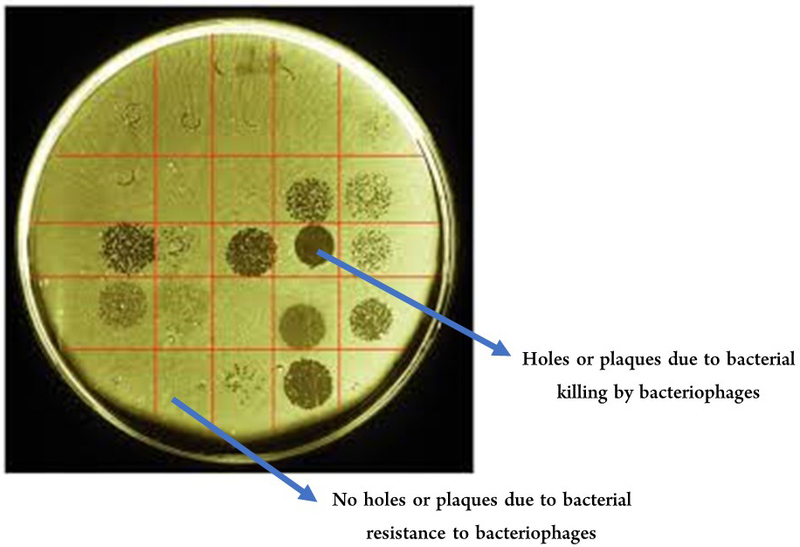 If The holes are the areas where the bacteria have been killed by the virus. Human outbreaks of Salmonella Typhimurium have been reported in developing and developed countries resulting in high morbidity and mortality. It is estimated that over 680,000 people die annually as a result of infection by invasive non-typhoidal Salmonella including Salmonella Typhimurium. An efficient laboratory system of epidemiological surveillance and outbreak investigation of Salmonella Typhimurium is therefore very crucial. Anderson phage typing is a rapid low cost approach used for more than four decades for epidemiological surveillance and tracing the source of outbreaks of Salmonella Typhimurium. It distinguishes Salmonella Typhimurium into more than 300 definitive phage types based on their patterns of lysis to specific Salmonella bacteriophages phages which are viruses that kill bacteria (Fig. 1.). However, it has been suggested that the high throughput clustered regular interspaced short palindromic repeats (CRISPR) typing has the potential to replace traditional phage typing for outbreak investigation of Salmonella Typhimurium. CRISPRs belong to CRISPR-Cas system that has been described as the adaptive bacterial immune system that provides acquired immunity against foreign DNA such as bacteriophages and plasmids. CRISPRs are acquired from invading bacteriophages or plasmids and get integrated within bacterial genome as spacers (interspaced regions between palindromic repeats) which are useful in providing information on the past exposure of the bacteria to foreign DNA. This article proves that CRISPR typing is not useful for epidemiological surveillance and outbreak investigation of Salmonella Typhimurium since there is no correlation between the phage type and CRISPR type of Salmonella Typhimurium strains. For example, strains of Salmonella Typhimurium belong to different phage types have identical spacer sequences and identical CRISPR type (Fig. 2a). Moreover, variations in the CRISPR type among strains of the same phage type have been also noticed (Fig. 2b). CRISPR typing has also failed to differentiate between outbreak and non-outbreak strains of Salmonella Typhimurium since identical CRISPR type was detected among Salmonella Typhimurium definitive phage type 8 (DT8) strains associated with the foodborne outbreak in the summer of 2013 in the States of Jersey, UK and other DT8 strains that do not belong to the outbreak. The presence of different CRISPR type within the same phage type and the presence of identical CRISPR type among different phage types of Salmonella Typhimurium confirms the limitations of CRISPR typing for outbreak investigation of Salmonella Typhimurium. CRISPR typing cannot therefore replace the old school of phage typing or used in public health laboratories to determine the epidemiological relation among Salmonella Typhimurium isolates. Fig. 2. 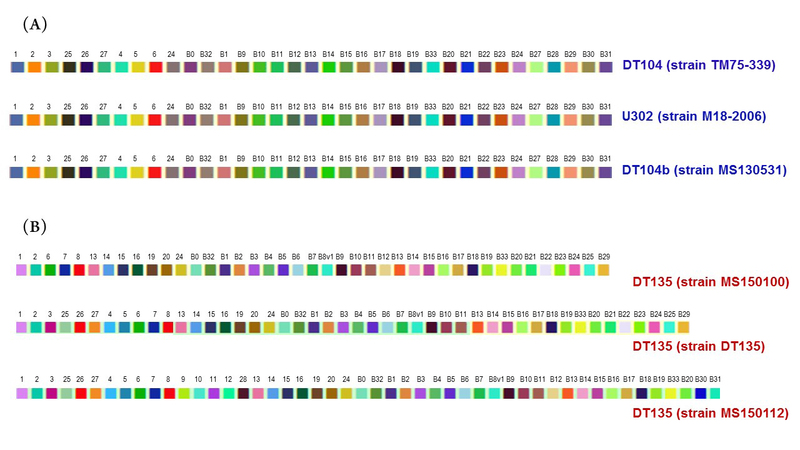 (A) Identical spacer sequences among different phage types of Salmonella Typhimurium (DT104, U302 and DT104b). (B) Different spacer sequences among the same phage type of Salmonella Typhimurium (DT135). However, with the recent advances in genome sequencing technologies, whole genome sequencing has the potential to replace the traditional laboratory methods including phage typing. Worldwide, Salmonella Typhimurium is the most dominant serovar of non-typhoidal Salmonella and has been associated with foodborne outbreaks in both developing and high-income countries. There is no vaccine against Salmonella Typhimurium furthermore, disease management is complicated by the emergence of multidrug resistant strains. It is therefore very crucial to use accurate and highly discriminative laboratory method for epidemiological surveillance and outbreak investigation.